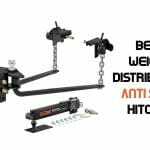 If you own an ATV or UTV then you probably know that you can get those vehicles in some tricky places and when you do you are going to need the best UTV winch to get the vehicle out. Everyone loves taking their ATV and UTV vehicles off-roading and riding them in mud, deep sand, and on inclines that are impossibly steep. Everyone also knows that the trips on your ATV and UTV that are the most fun and the most memorable are the ones where you have to use the winch to get the vehicle back on solid ground, and the really fun trips have you using the winch several times in one day to get the vehicle back on solid ground. With 55’ of ¼” synthetic rope you will be able to find something sturdy to tie off to so you can winch your ATV or UTV out of a tight spot and back onto solid terrain. The motor on this winch is a 1,6 permanent magnet motor that is sealed so the dust, mud, snow, or water that you encounter on your adventure is not going to cause any disruptions in the motor functions. The load holding brake mechanism will guarantee that if you stop winching the vehicle then the winch will not let the vehicle slip and cause you to lose all of the progress you have made. This feature is also excellent when you have to lift the front end or rear end of the vehicle up so that you can repair something on it. The load holding brake will not let the vehicle drop so you can work safely and then let the vehicle down easily. To make this winch even better you get an all steel planetary gear so the gear is strong, and the gear is twice the size of the planetary gears on most winches of this sort so there is a lot less chance of breakage and shearing, and top all of that off with bronze bearings and you have a tough, reliable winch. Some of the features of this winch that will simply amaze you are the handle bar mounted remote control, the roller fairlead and the mounting channel the winch comes with. You are also going to love the airplane quality super duty cable that the winch is spooled with. This hoss of a winch can pull up to 3,000 pounds and that 49 feet of airplane quality cable is not going to break or fray because of the strain you place it under. You can use this cable in rocky terrain and never worry about the rocks nicking and reducing the strength of your pulling cable. You will have braking power that will not allow your winch to release your load that you are working on until you are ready for it to be released. So if you have to stop the winching process and move a piece of debris or reposition something you can rest assured that the Champion 3000 lb ATV/UTV winch will keep whatever you had it pulling in the exact position that you stopped in. The kit comes with everything that you need to mount it on your ATV/UTV and start using it. You do not have to purchase any accessories to make your winch functional. 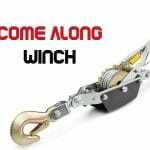 When you are buying a winch to use on your ATV or UTV vehicle then you are looking for durability, dependability, strength, and practical features. 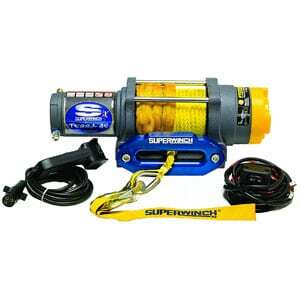 This Superwinch has all of those bases covered for you. It is a durable unit with a sealed 1.2 permanent magnet motor and a handle bar mounted rocker switch along with a handheld remote. You know sometimes you cannot be sitting on the vehicle when it is being pulled out of a sticky situation so that handheld remote allows you to be close enough to get the work done but far enough away from the pulling to stay safe. This winch can pull up to 3000 pounds so the majority of ATV vehicles and side-by-side vehicles can be easily pulled using this device. It is also very quiet when it is in operation so if you were using this item on your hunting lease the noise of your winch motor is not going to disturb the wildlife or the other people on the lease. It comes with fifty foot of 3/16” wire rope and a 3 stage planetary gear that is made of all metal so it is rugged and will not break or shear off teeth easily. 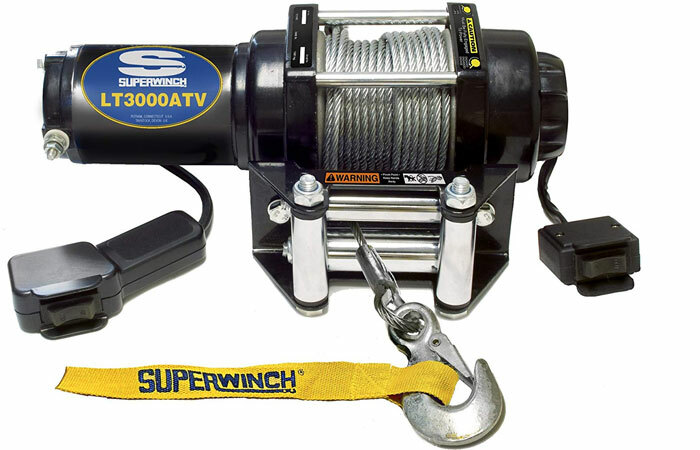 When you ride a big ATV then you want a powerful winch that can pull as much as 4,000 pounds like this Superwinch 1140230 can. The housing of the winch is aluminum so it resists rusting and can withstand exposure to the elements of heat and cold. It has a handle bar mounted rocker switch so you can pull things while you are sitting on the ATV and it also comes with a handheld remote so you can pull the ATV or other things without being on the ATV. The motor is sealed so the rain, dust, snow, and other things Mother Nature has to throw at you will not, and cannot effect your motor functions. It has a mechanical and dynamic brake so you can stop the pulling of a load and still remain safe, and not lose or drop what you were lifting and pulling. The fifty foot of 3/16Th Dyneem synthetic rope assures you that you will be able to find a tree or something stationary to tie your winch line to so you can pull your ATV or UTV out of mud, snow, deep sand, or back onto solid ground. The drums are reinforced steel unlike the majority of other ATV winches that have cast aluminum drums. If I had to say that there was something I did not like about this winch I would say that I do not like the fact that the winch mounting plate is sold separately from the winch. I would also have to say that I like the fact that each mounting plate is specifically designed to fit particular ATV types and have specific bolt patters so that you can rest assured that your winch will be securely mounted to your ATV or UTV vehicle. The wireless remote control that comes with this winch insures you that you never have to put yourself in harms way to winch a load or to winch your vehicle out of the mud, snow, sand, or bad situation that it is in. This winch has synthetic rope instead of steel cable. You might think that the inch would have less pulling power because of that synthetic rope but you would be wrong. This rope can handle as much as 3500 pounds and you do not have to worry about injuring your hands like you do when you are using steel cable, you want have cuts and knicks from burrs on the cable. 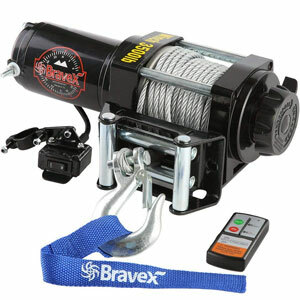 The Bravex Electric 12V 3500lb single line waterproof winch for UTV and ATV pulling can be the reason why you have more fun on your outings. 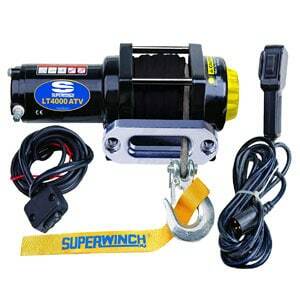 This winch is capable of pulling up to 3500 pounds and the high powered motor drive provides you with a strong steady pull so you do not just get short bursts of pulling power followed by periods where you have to let the winch rest. 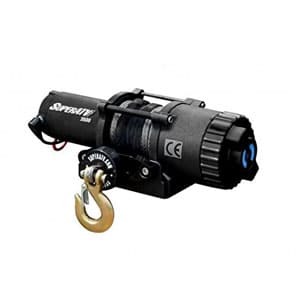 The gearing on this winch is crafted from all metal so each gear has the ultimate amount of strength and durability. It provides fas and reliable line speed and the remote control s sensitive and will easily follow the gentle pressures and commands you give it. There is a four way roller fairlead so when the rope is being wound around the drum it is guided into the proper positions evenly. This saves you time and frustration when you have to remove some of the rope from the spool to use again later. It is incredibly easy to install and operate. 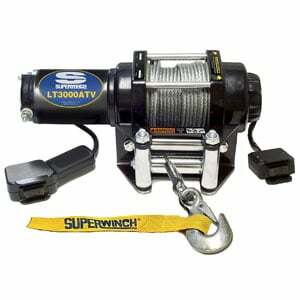 You will get long lasting service and peace of mind from this winch. If you want a winch that can supply a strong and steady pulling power then this is the winch you have been looking for. The Megaflint 3500 is designed to move up to 3500 pounds freely and smoothly. It comes with a four way roller fairlead so the rope is always wound back on the drum evenly and in perfect position. It has a handle bar mounted remote that controls the line whether you are letting line out or pulling the line back in. It is attractive and it is dependable. You will not find yourself stuck between a rock and a muddy place if you have this winch mounted on your ATv or UTV vehicle. Your winching control is made better by the braking system built into the winch design. The remote control is sensitive so you do not have to force the buttons or have a great amount of hand strength to operate the remote. 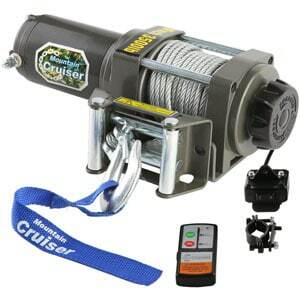 The winch comes complete with a control box, a four way roller fairlead, a forged steel tow hook, a set of bolts, stainless steel rope that will not rust or corrode, a wired remote switch and a wireless remote control, as well as an easy to read and understand instruction manual. How much weight the winch is capable of pulling. 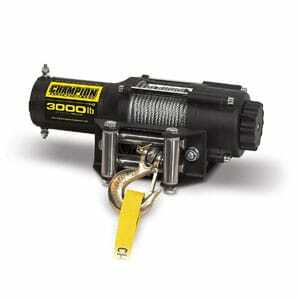 You do not want to buy a winch that cannot handle the weight of the ATV or UTV vehicle that you normally ride. The braking system and the ability to hold the load in place when you are not pulling. This is a safety feature that is a necessity on any ATV or UTV winch. A sealed solenoid is a must have. You are using this winch on a machine that will be out in the elements of rain, snow, humidity, sand, dust, and more you want your solenoid to be sealed so that you do not have to worry about corrosion, rust, or your winch not operating when you need it to operate. Nothing is more frustrating than having to work on your tools in order to work on getting your vehicle unstuck. You want a long enough length of heavy duty high quality cable, steel rope, or synthetic rope. It is nice to have at least fifty foot of pulling rope. You want the motor to be sealed so it is protected from rain, dust, snow and other things that could interrupt the service and connections inside the motor. You want a fairlead roller that will keep your rope evenly distributed on your drum when you are respooling your rope or cable. If the rope is not spooled back around the drum evenly then it will be very hard to get it off of the drum when you need it and you end up with a frustrating experience. You want a wireless remote or at the very least you want a remote with a cable long enough that you can stay a safe distance away from the vehicle while the winch is in operation. You want your planetary gear to be made of solid metals so there is a reduced risk of gear teeth shearing off and so the gears can function smoothly and not start and stop abruptly. The best UTV winch is not always the most expensive winch or the biggest winch. The best one for your needs is one big enough to move the ATV or UTV that you need to keep pulled out of mud, snow, sand, gravel, and such. You want to get a winch that has the power to do the work you need and has the safety features that will stop you from getting any possible injuries while you are using the winch. Consider each feature of the winch before you buy it and make sure that the winch you buy has the features you are most interested in.